Cuban leader Raul Castro has demanded the US hand back the Guantanamo Bay military base before relations with Washington are normalized. In a speech, President Raul Castro also called for the lifting of the US trade embargo and Cuba’s removal from a terror list. Last month Cuba and the US announced a thaw in relations, agreeing to restore diplomatic ties which were severed in 1961. High-level talks were held last week. A Congressional delegation arrived in Havana to begin negotiations aimed at reopening embassies in the two countries’ capitals. Meanwhile, former Cuban leader Fidel Castro appeared to signal his approval for the political rapprochement. He wrote that although he did not “trust the policy of the US”, it did not mean he rejected a “peaceful solution to conflicts”. Fidel Castro’s brother, Raul, who succeeded him as president in 2008, made his demands at the summit of Community of Latin American and Caribbean States in Costa Rica. “The reestablishment of diplomatic relations is the start of a process of normalising bilateral relations,” he said. The land on which the base stands was leased to the US government in 1903 by Cuba’s then-rulers. 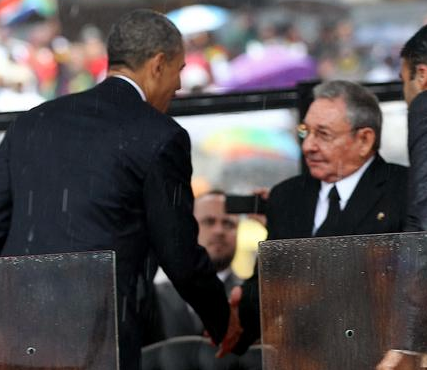 US officials have so far not responded to Raul Castro’s remarks. President Barack Obama has called on Congress to put an end to the trade embargo, which has been in place since 1962. Earlier this month President Barack Obama also used his executive powers to loosen trade and restrictions on travel to Cuba.